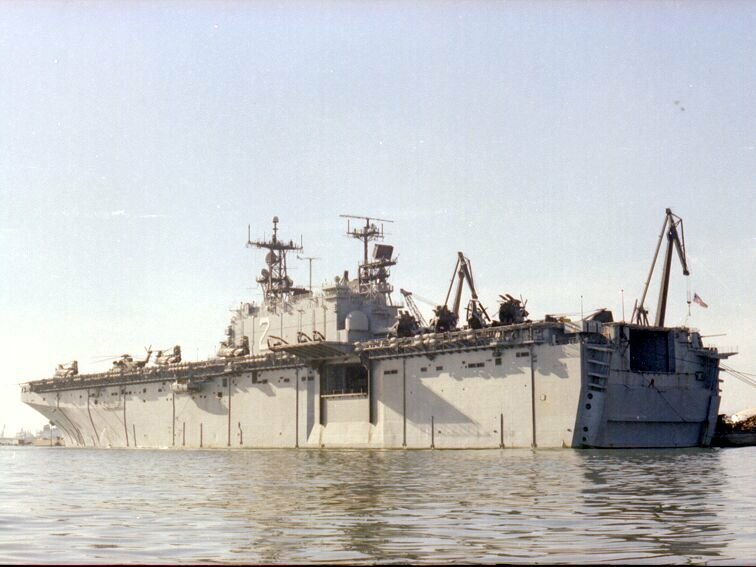 Laid down, 21 July 1972, at Ingalls Shipbuilding Corp. Pascagoula, MS.
USS Saipan is assigned to Amphibious Group Two, COMNAVSURFLANT, and is homeported at Norfolk, VA.
Decommissioned and Struck from the Naval Register, 25 April 2007, at Naval Station Norfolk, VA.
65k USS Saipan (LHA-2) under way circa late 1970s. 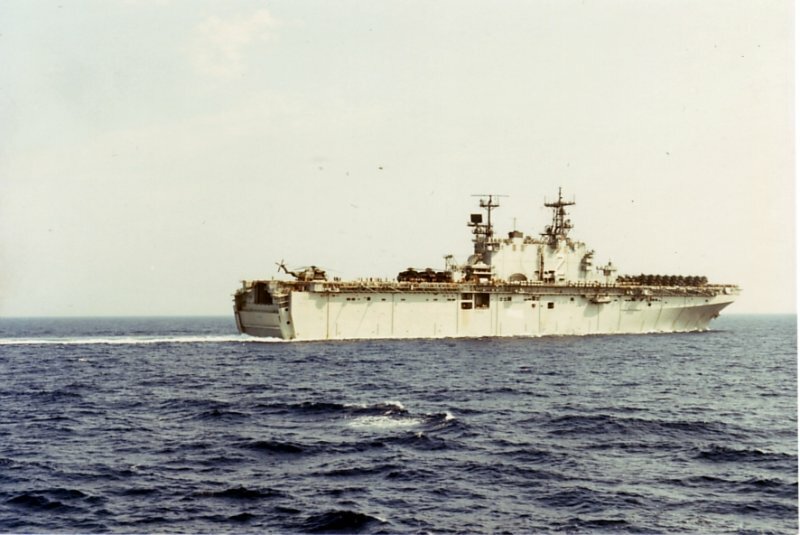 291k USS Saipan (LHA-2) under way in October 1977. 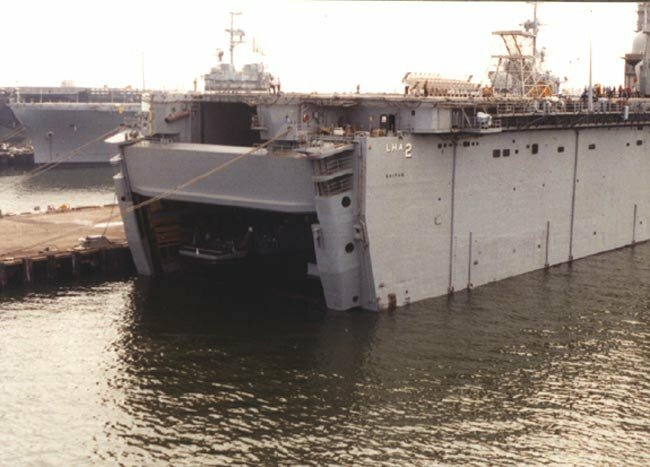 The image shows to good effect the floodable docking well for the four LCUs; above on deck, are two LCM-6s, handled via the adjacent crane. 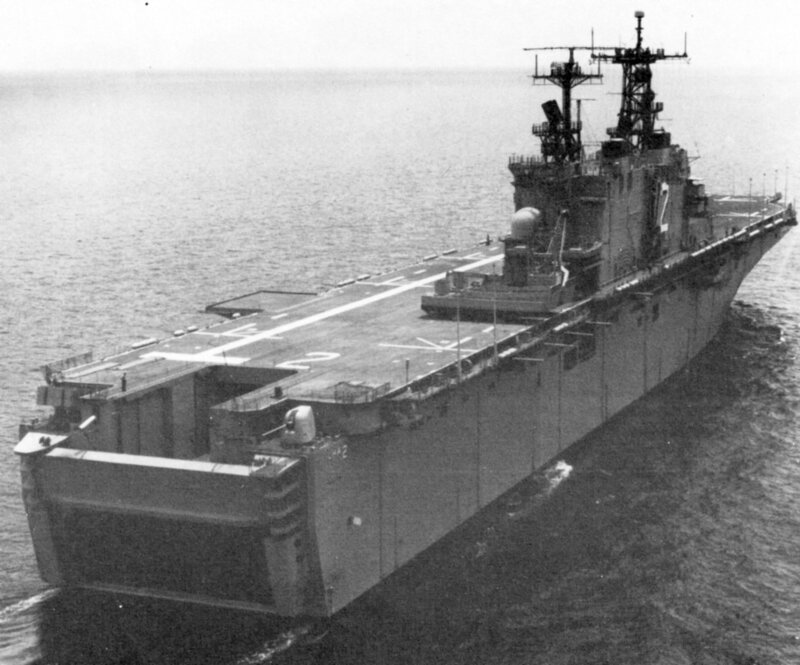 The large dome abaft the island conceals the CCA radar. 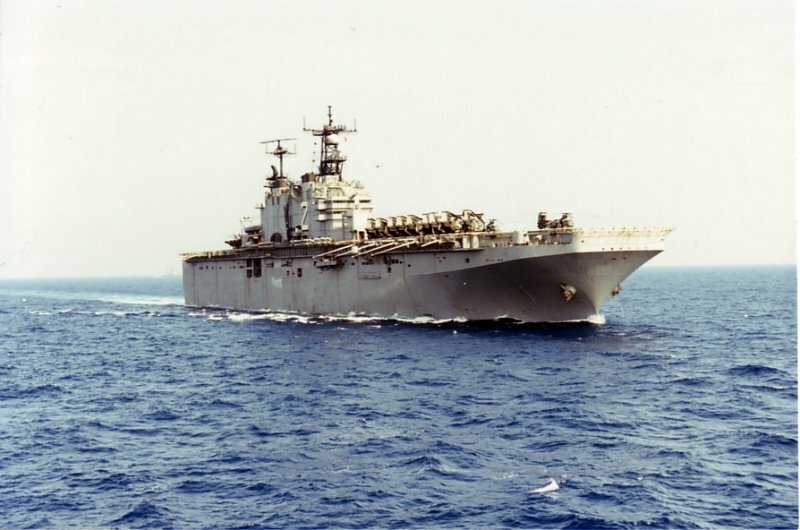 45k USS Saipan (LHA-2) crew members man the rails as the ship enters or leaves port, date unknown. 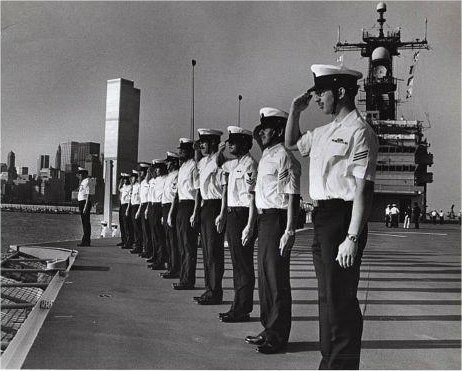 Note the "Salt and Pepper" uniform. 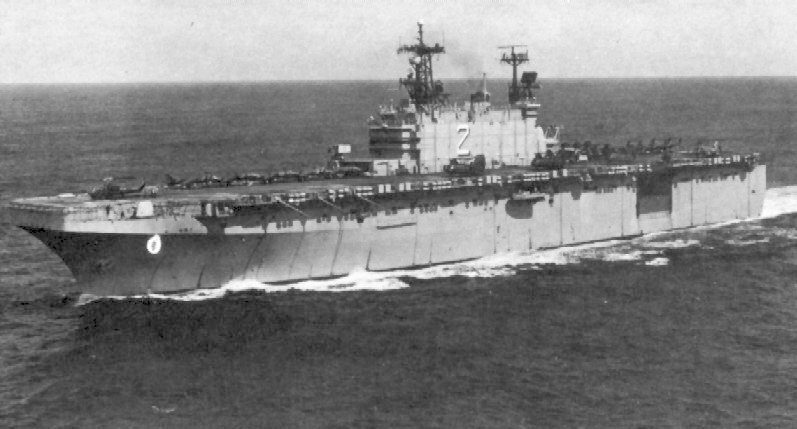 58k USS Saipan (LHA-2) under way, date and location unknown. 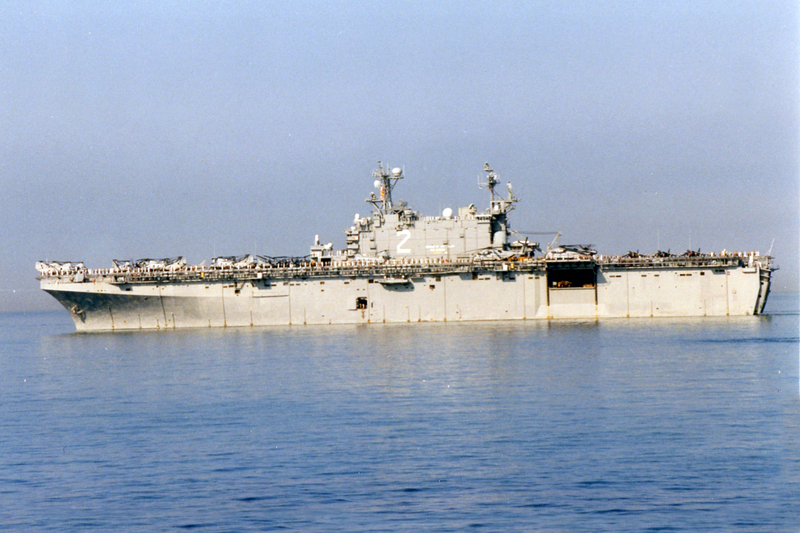 70k USS Saipan (LHA-2) under way, September 1980, location unknown. 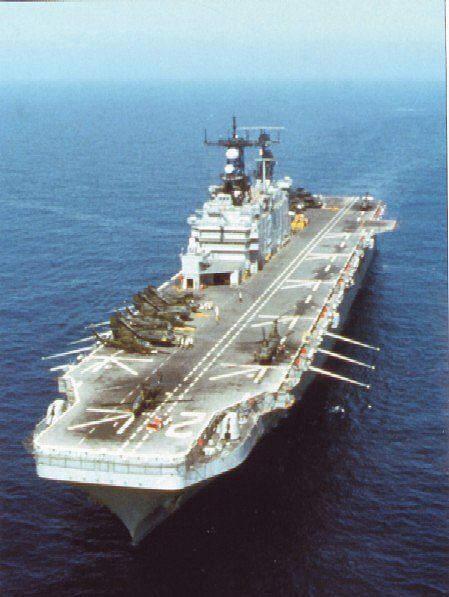 Note the single CH-46 Sea Knight helicopter forward and the AV-8A Harrier jump jets and OV-10D Bronco light attack aircraft. 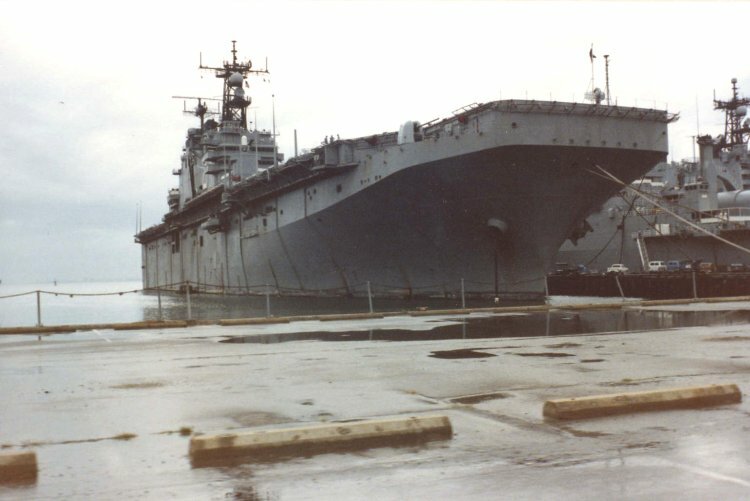 83k USS Saipan (LHA-2) at Naval Station Rota, Spain, 2 December 1996. 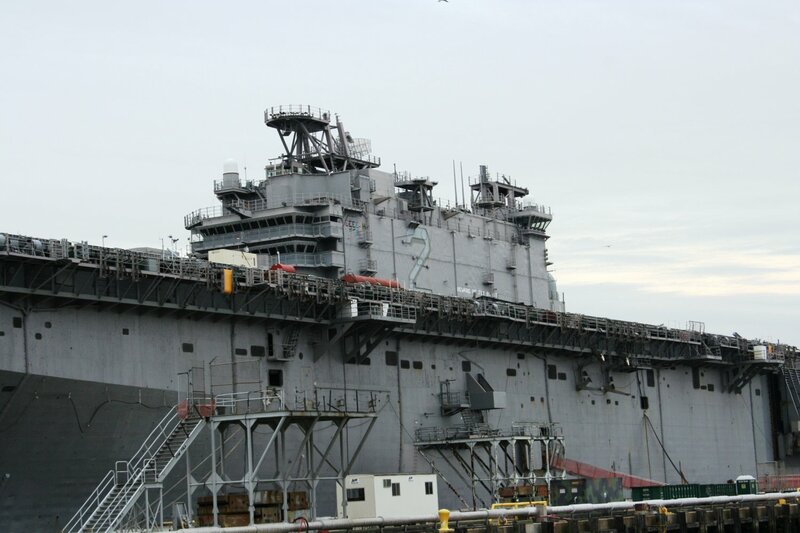 Amphibious Readiness Group (COMPHIBRON 6) pulled into Rota to do the necessary washdown and inspection of equipment. 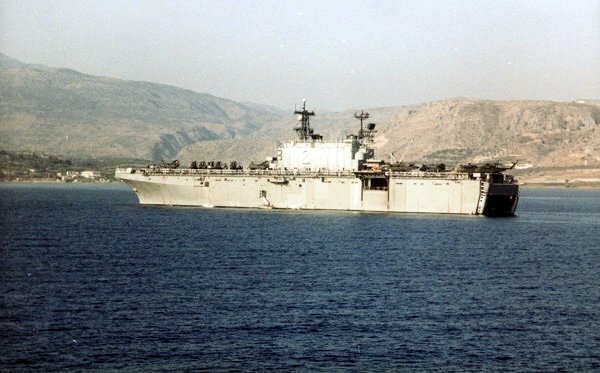 The visit lasted 5 days, during which time all land vehicles aboard the USS Saipan (LHA-2), USS Gunston Hall (LSD-44), and USS Austin (LPD-4) were moved to the piers and beaches in Rota's harbor area and washed thoroughly to remove agricultural debris. 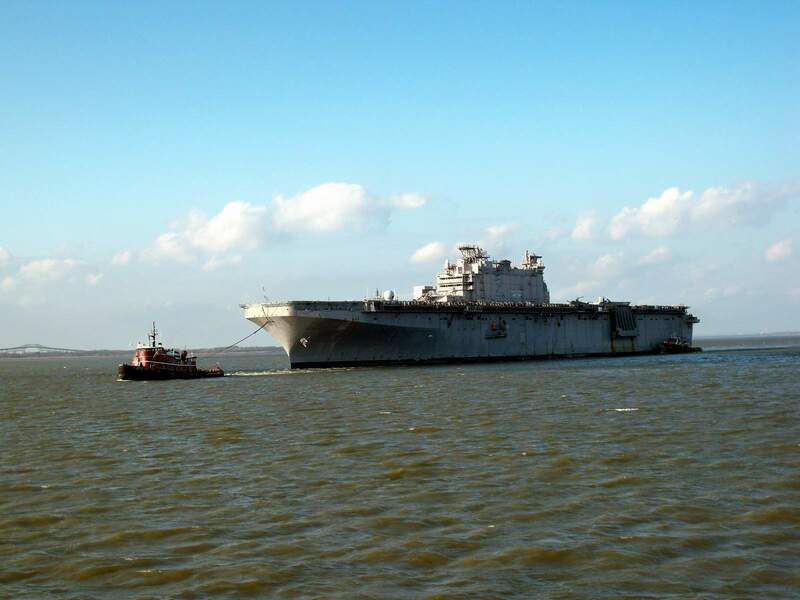 This process is a safeguard against introducing foreign insect and plant species to the United States. 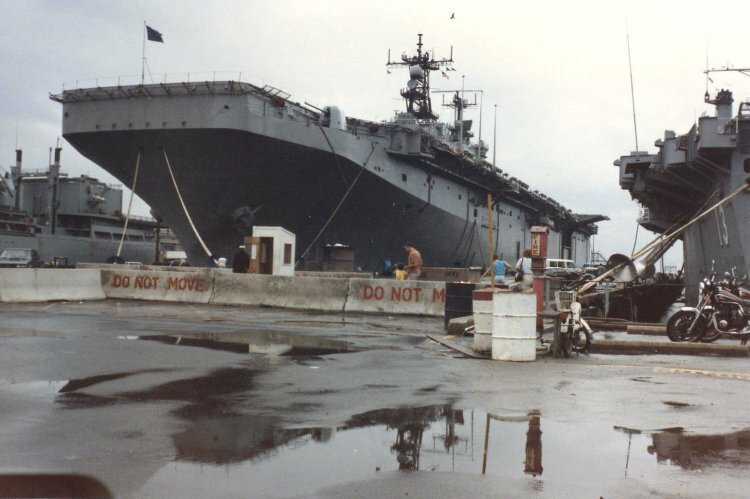 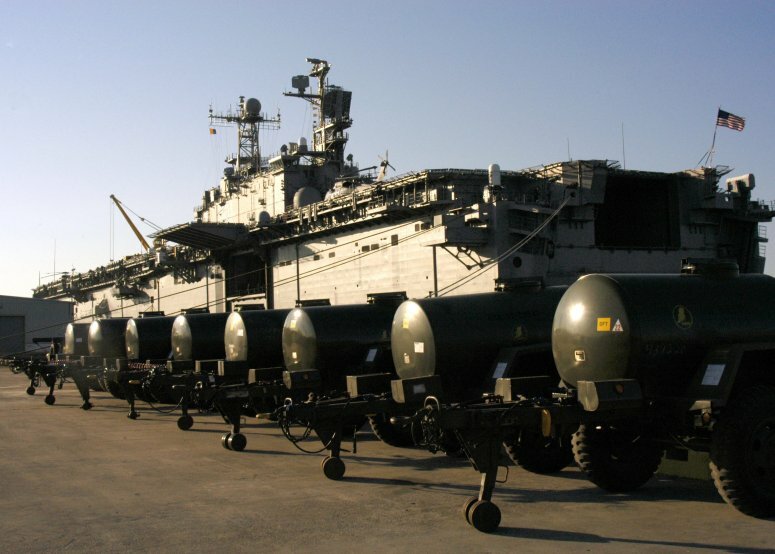 Some 130 vehicles, including M-1 Abrams tanks, were cleaned during the port visit. 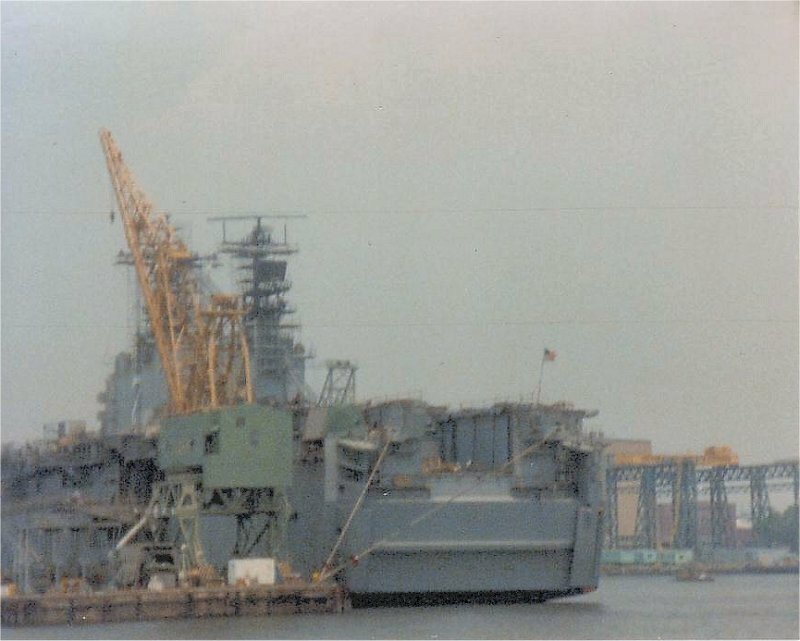 In this photo Saipan (LHA-2) gets a tow from Rota's tugs for help in docking at pier one. 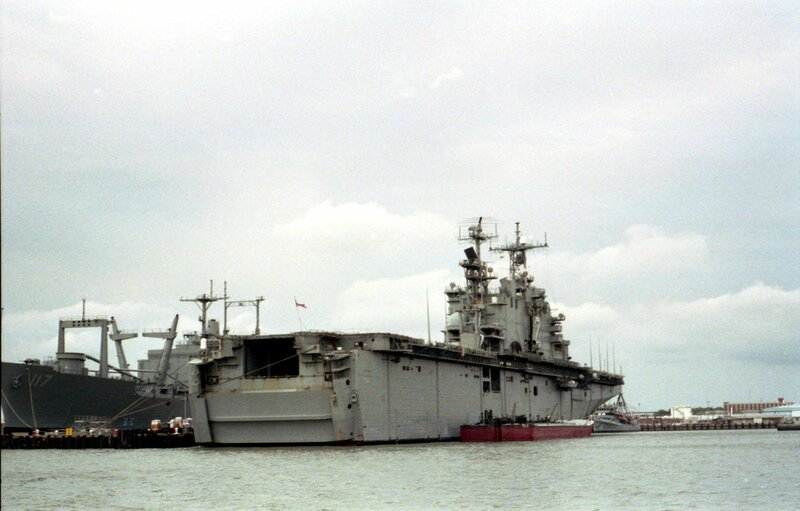 92k USS Saipan (LHA-2) at Naval Station Rota, 2 December 1996. 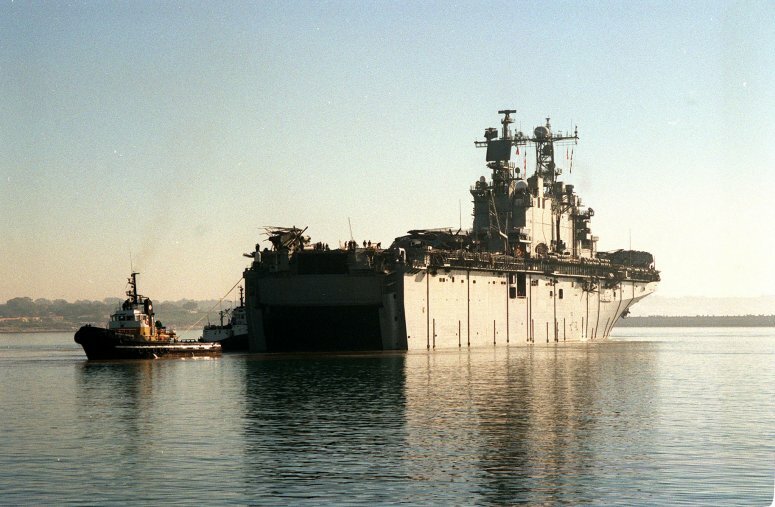 Amphibious Readiness Group (COMPHIBRON 6) pulled into Rota to do the necessary washdown and inspection of equipment. 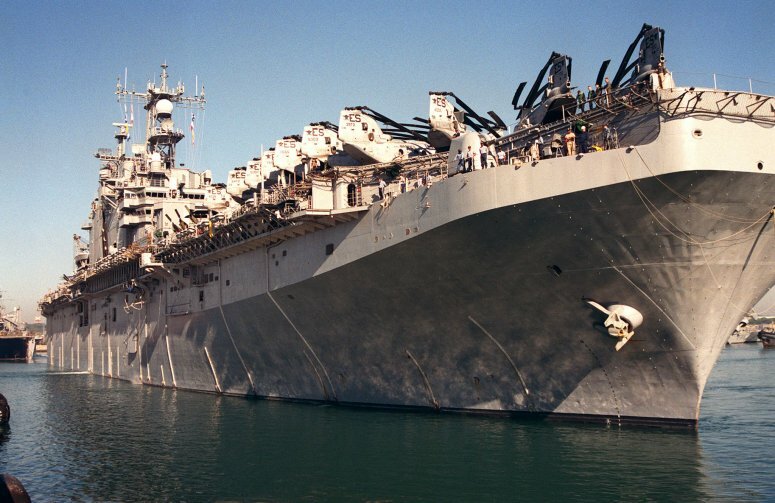 During the visit all land vehicles aboard the USS Saipan (LHA-2), USS Gunston Hall (LSD-44), and USS Austin (LPD-4) were moved to the piers and beaches in Rota's harbor area and washed thoroughly to remove agricultural debris. 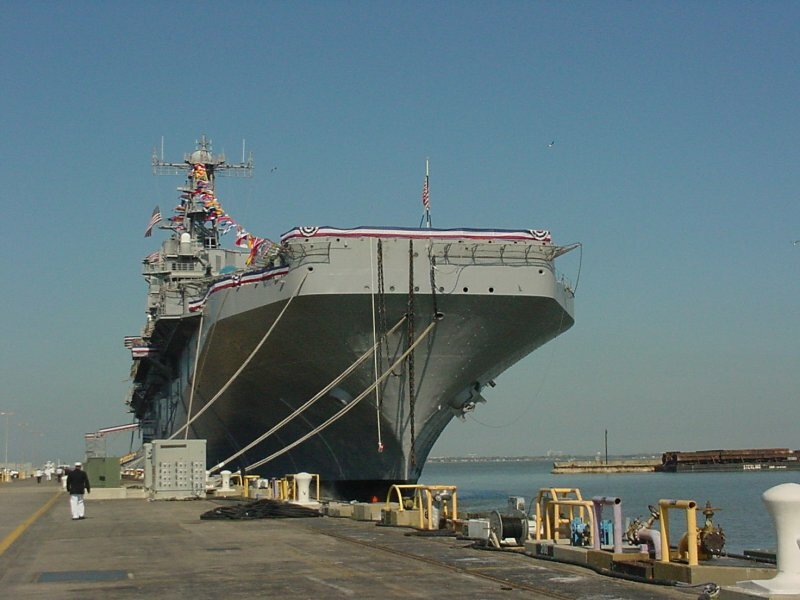 This process is a safeguard against introducing foreign insect and plant species to the United States. 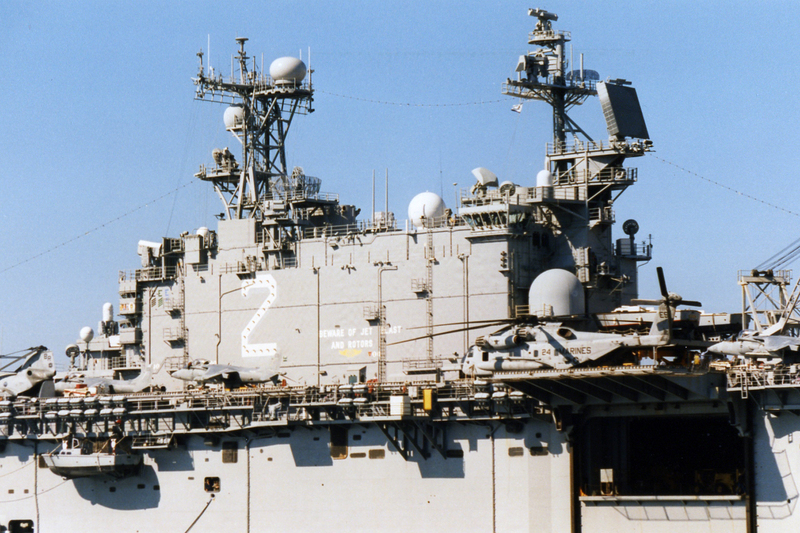 990116-N-4004O-503 ABOARD USS SAIPAN (January 17, 1999) 450k An MV-22B "Osprey" makes its landing approach to the flight deck of USS Saipan (LHA-2) during deck landing qualifications, 17 January 1999. 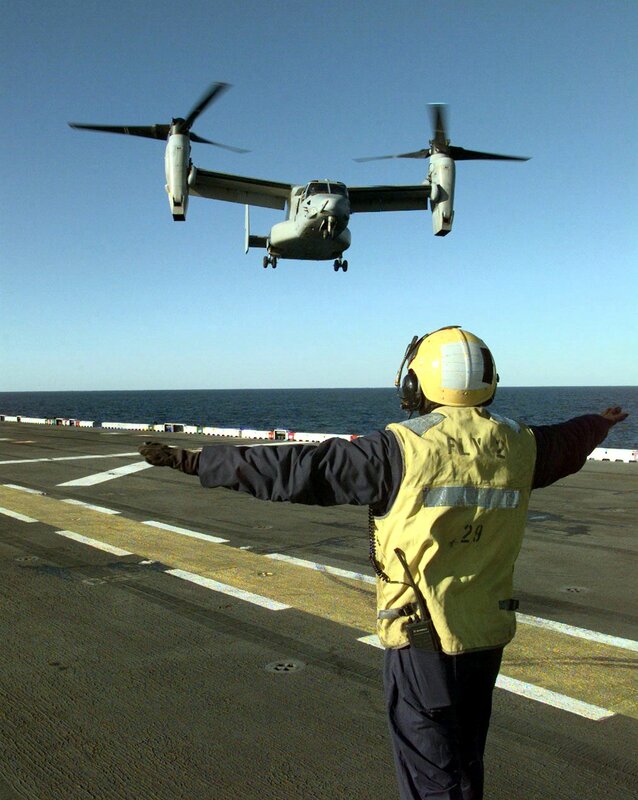 The Osprey is conducting aircraft shipboard developmental tests on board Saipan and represents their first launchings and recoveries aboard an LHA. 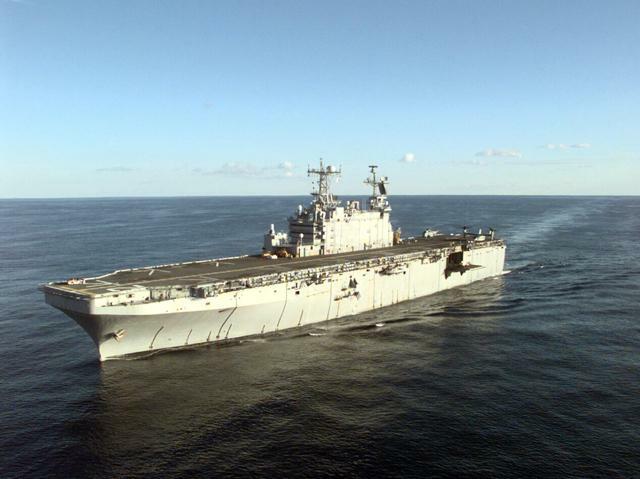 37k USS Saipan (LHA-2) under way off the coast of South Carolina during the MV-22B Osprey aircraft's shipboard developmental testing. 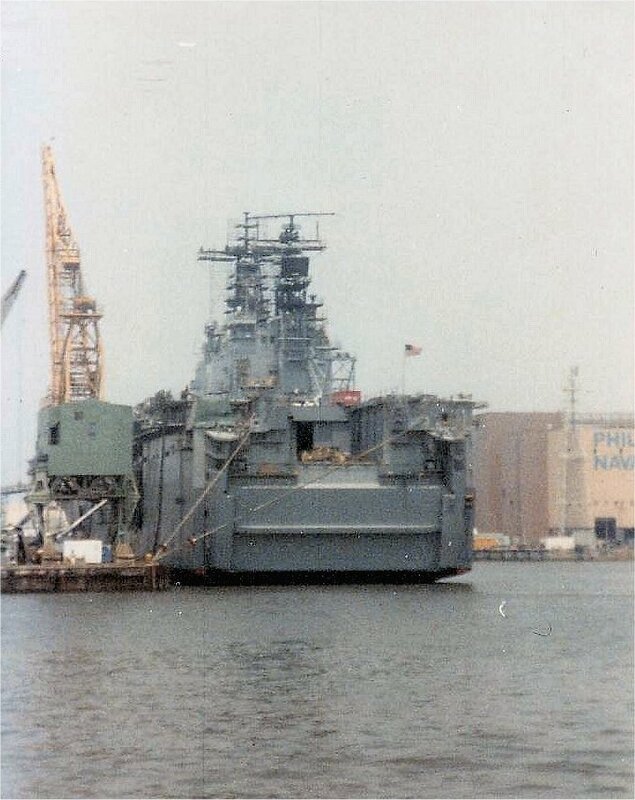 Photo by PH1 Benjamin D. Olvey. 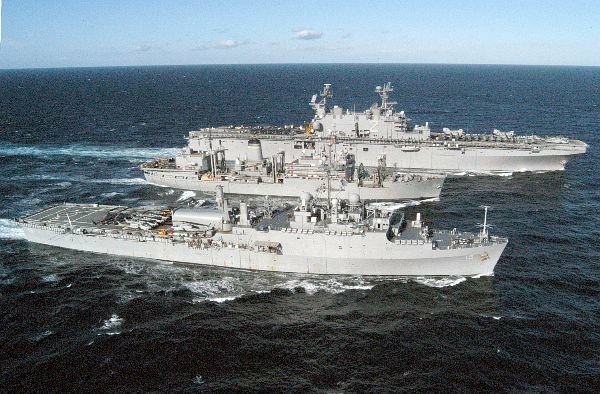 111k USS Saipan (LHA 2) left, and USS Ponce (LPD 15) flank the underway replenishment oiler USNS Patuxent (T-AO-201) during a simultaneous underway replenishment (UNREP), 21 September 2002. 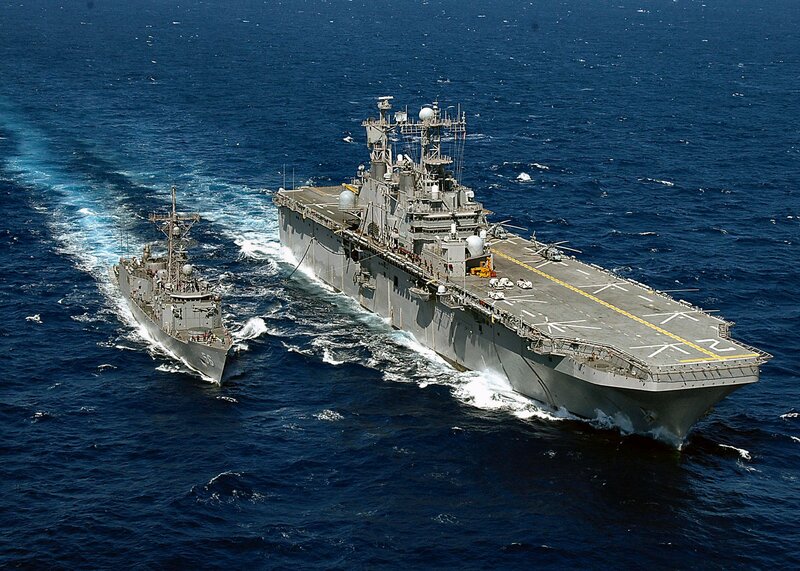 Saipan was conducting underway training in preparation for an upcoming regularly scheduled deployment. 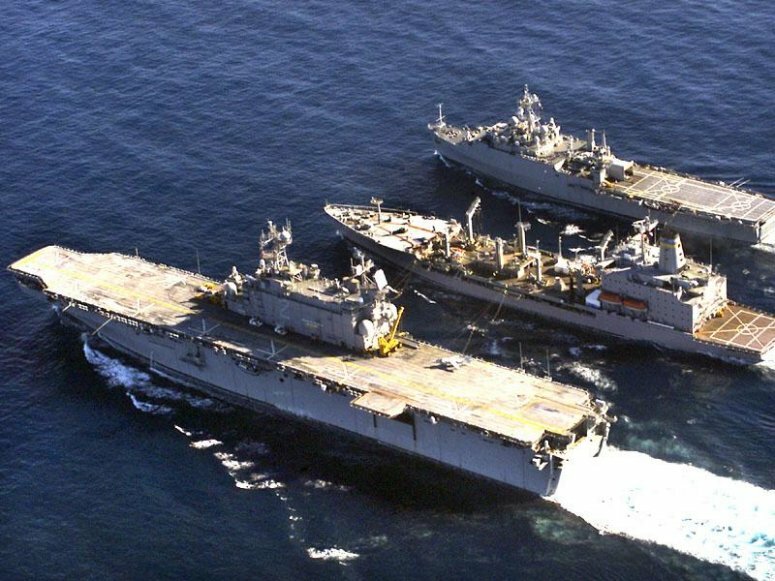 74k USNS Spica (T-AFS-9) prepares to conduct a simultaneous Refueling at Sea (RAS) with Amphibious Assault Ship USS Saipan (LHA 2) (top) and Amphibious Transport Dock USS Ponce (LPD 15) (bottom). 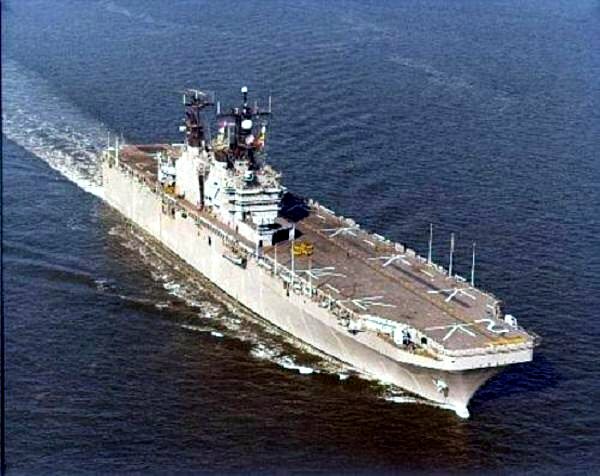 Saipan and Ponce are part of Amphibious Task Force East (AFT-E), underway on an un-scheduled deployment in support of Operation Enduring Freedom. 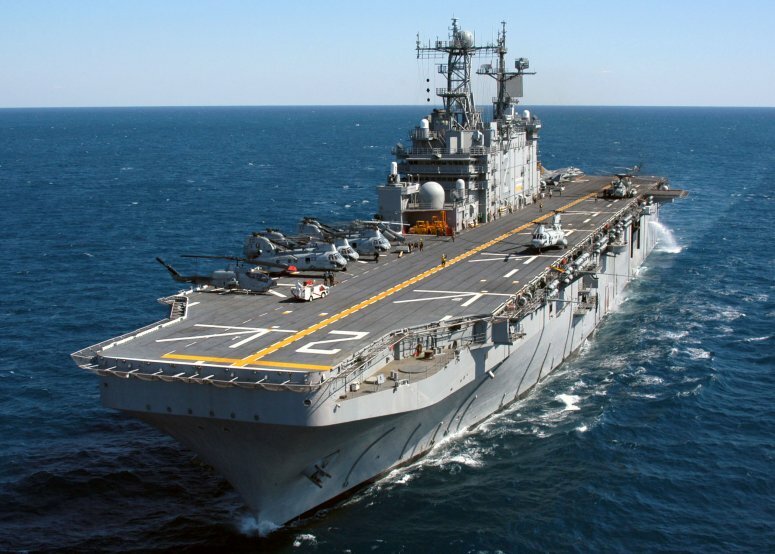 94k USS Saipan (LHA 2) prepares to launch a CH-46 Sea Knight and CH-53 Super Stallion from it's flight deck during Expeditionary Strike Group (ESG) integration training in preparation for the ship's upcoming scheduled deployment. 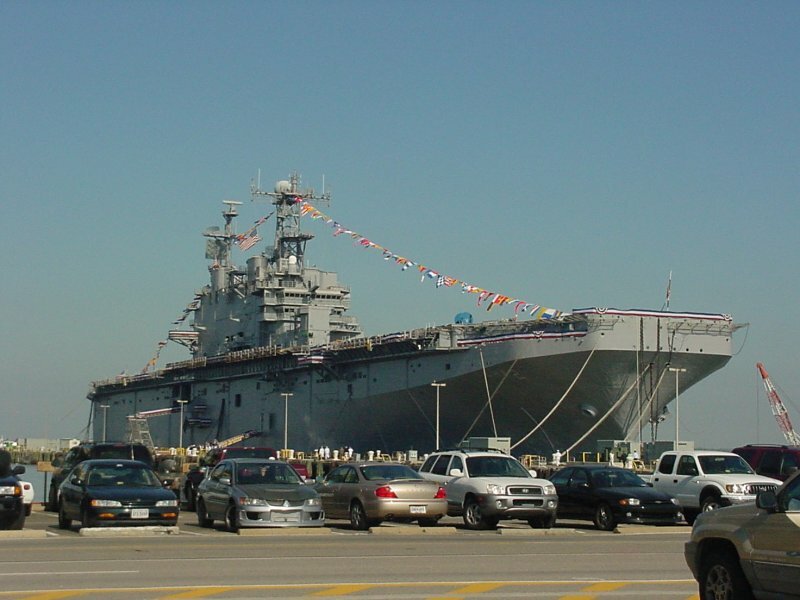 75k USS Saipan (LHA-2) moored pierside at Pascagoula, MS., 25 January 2005. 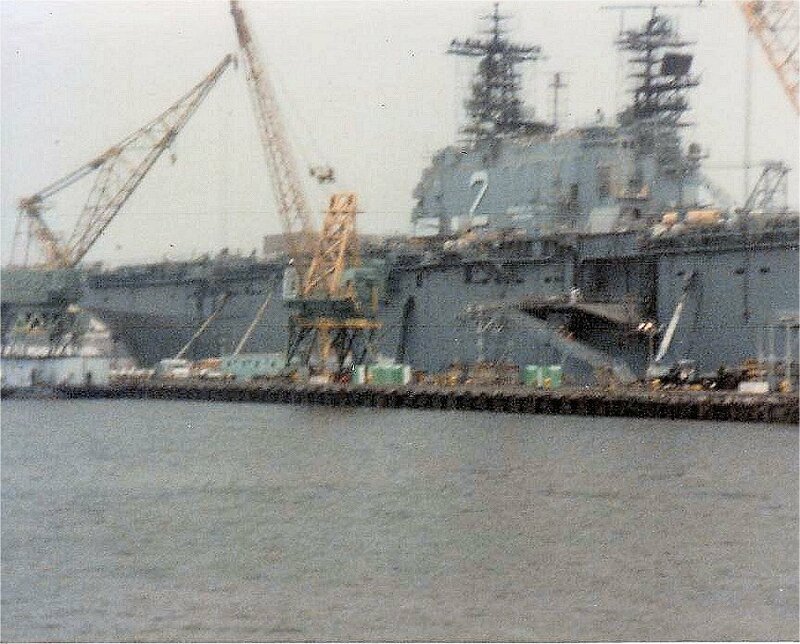 Eight 400 gallon water tanks are lined up in preparation to be loaded aboard the ship. 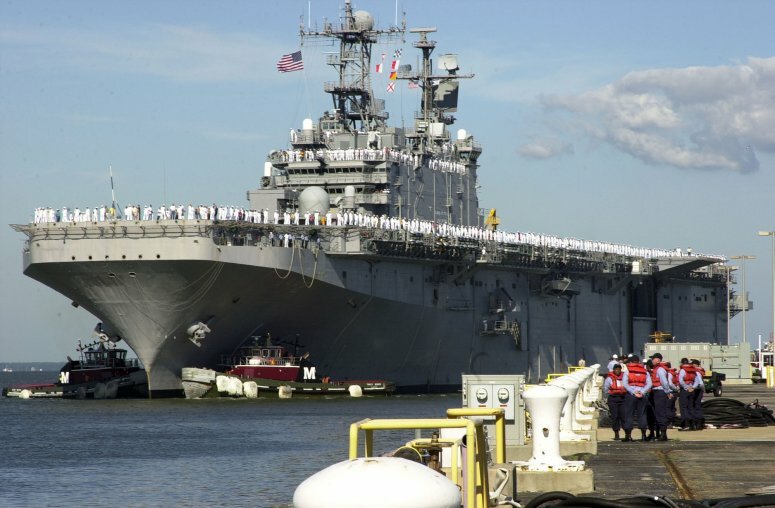 Saipan is/was on a scheduled two-month deployment to the U.S. Southern Command (NAVSO) area of responsibility in support of New Horizons, the humanitarian assistance efforts in Haiti. 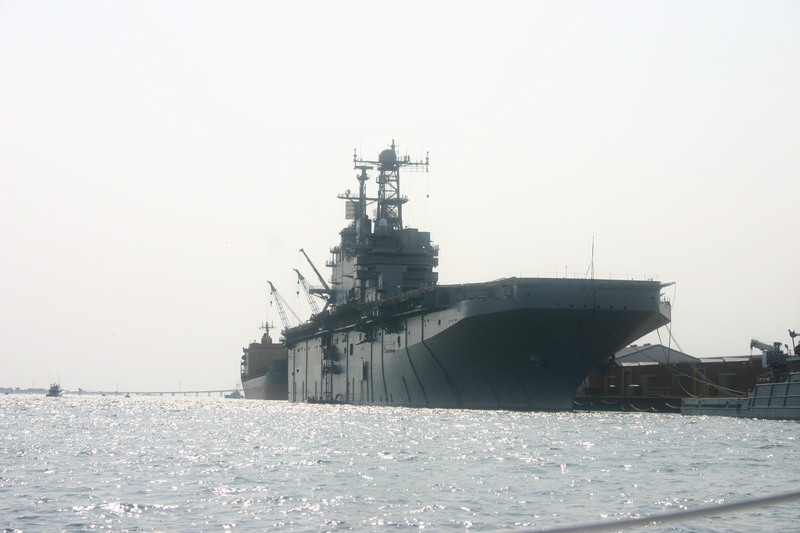 80k USS Saipan (LHA 2) returns to her homeport at Norfolk, VA., 25 August 2005. 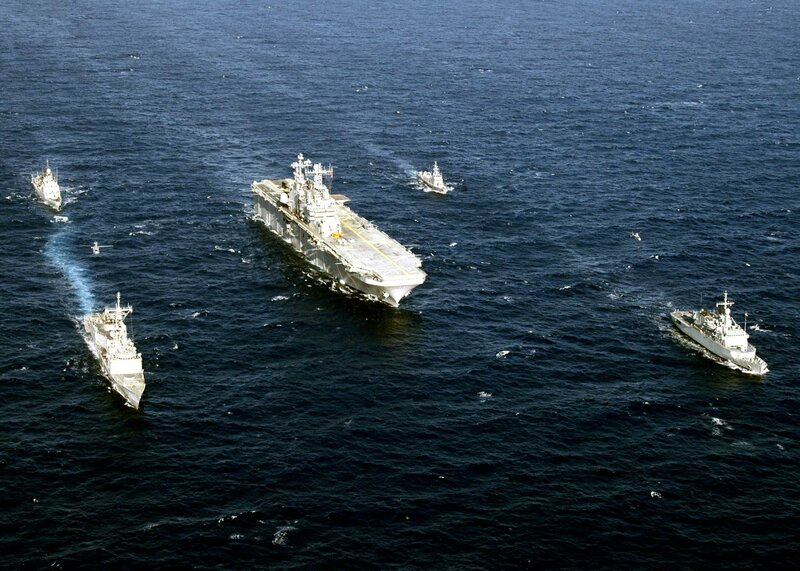 060604-N-2651J-257 399k USS Saipan (LHA 2), guided-missile frigate USS Simpson (FFG-56), Armada Espanola Infanta Elena (P-76), Royal Moroccan Navy Frigate Mohammed V (F-611), and Algerian Naval Forces El Kirch (353) sail in formation in the Mediterranean Sea. 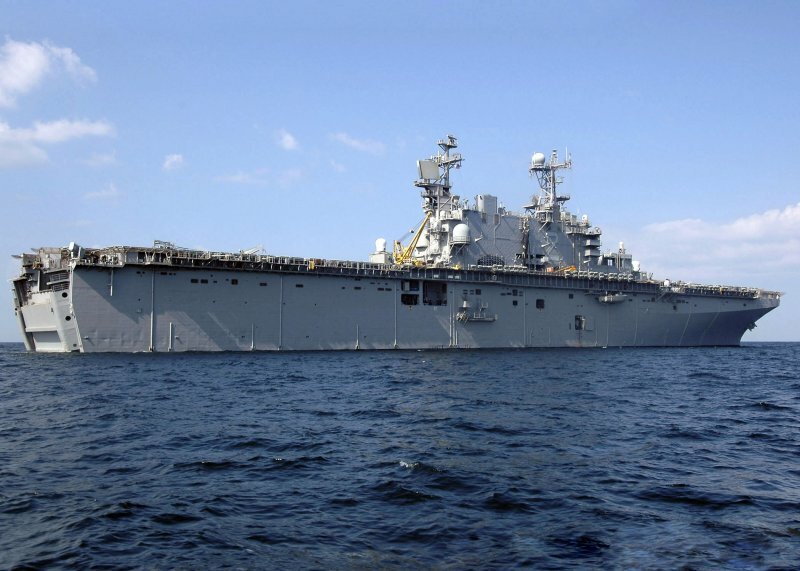 Exercise Phoenix Express will provide U.S. and allied forces an opportunity to participate in diverse maritime training scenarios helping to increase maritime domain awareness and strengthen emerging and enduring partnerships. 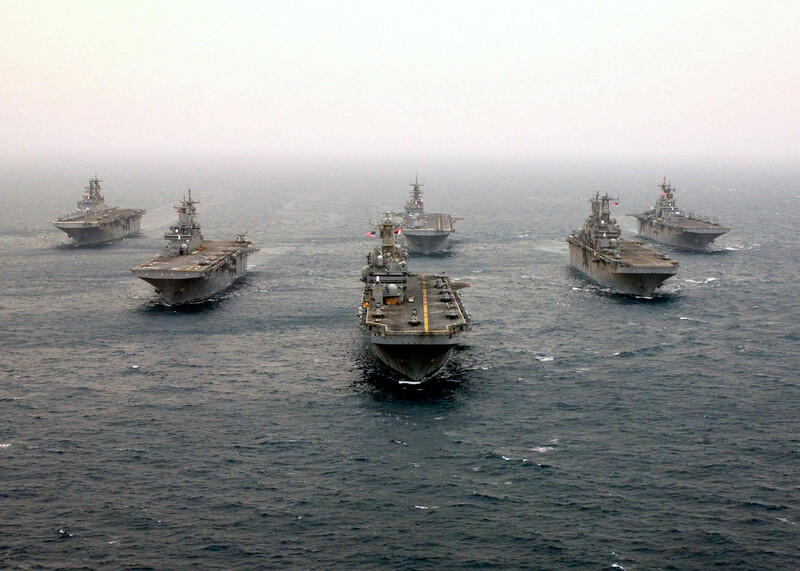 74k USS Saipan (LHA 2) under way in the Persian Gulf, 17 September 2006. 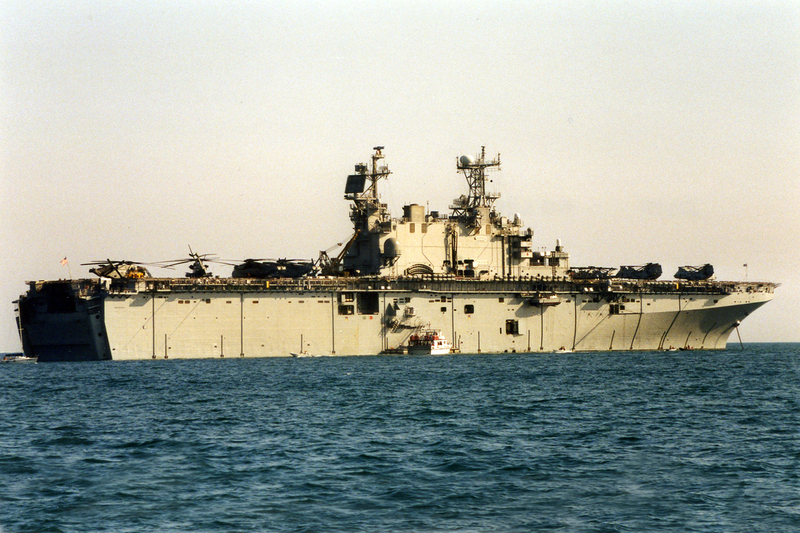 MK-105 Magnetic Influence Minesweeping Systems are towed behind two MH-53E Sea Dragons assigned to Helicopter Mine Counter Measure Squadron One Five (HM-15) during operations with Saipan. 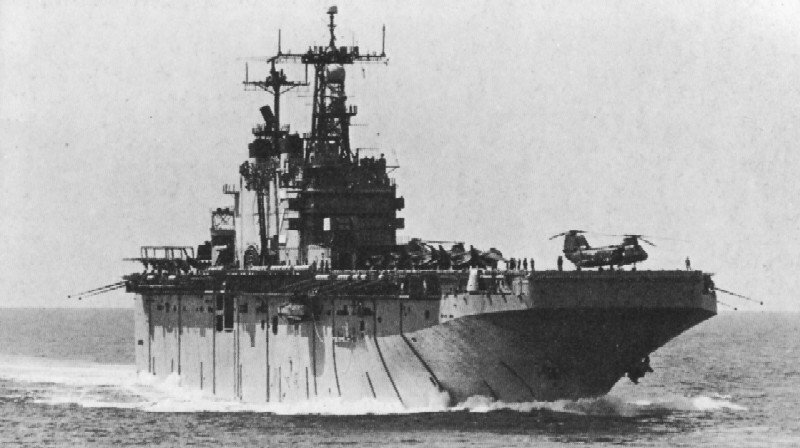 The MK-105 Magnetic Influence Minesweeping System is a high-speed catamaran hydrofoil platform also known as a "sled." 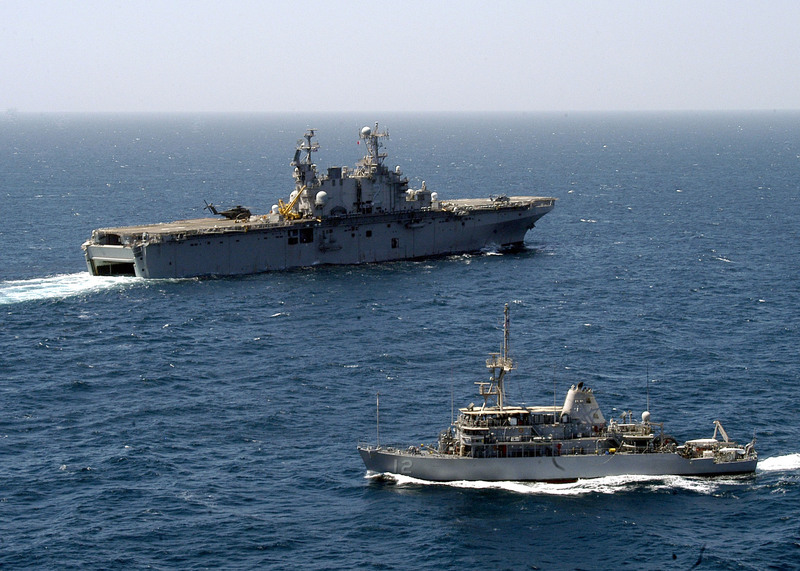 Saipan and HM-15 conducted a Mine Countermeasure exercise in the Persian Gulf. 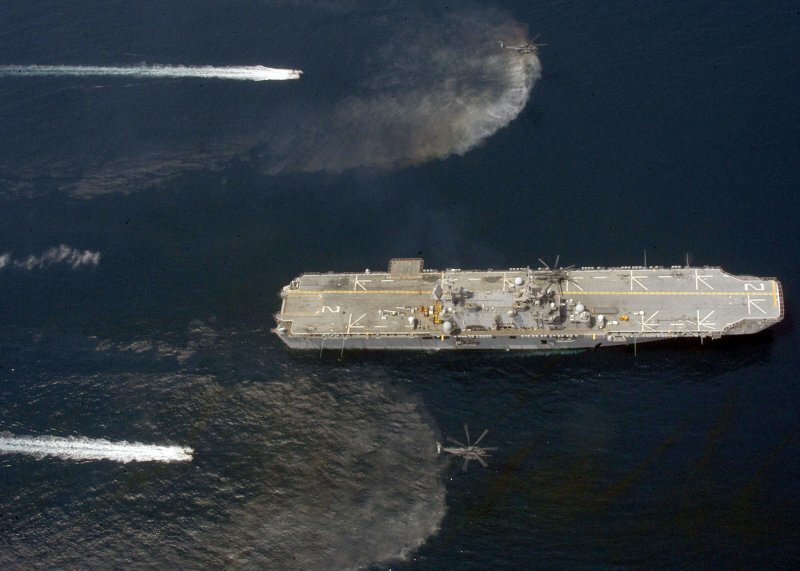 566k USS Saipan (LHA 2) and mine countermeasure ship USS Ardent (MCM-12) conduct mine sweeping operations in the Persian gulf. 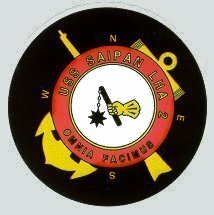 Saipan was deployed conducting maritime security operations (MSO) in support of the global war on terrorism. 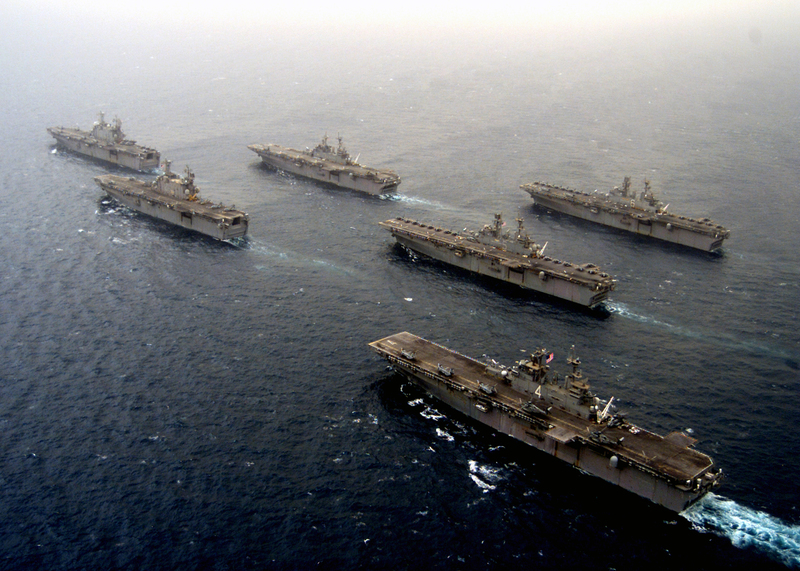 113k USS Dwight D. Eisenhower (CVN-69) transits in the Arabian Sea, 20 November 2006, in formation with USS Anzio (CG 68), top, and USS Saipan (LHA-2) bottom, during a photographic exercise (PHOTOEX). 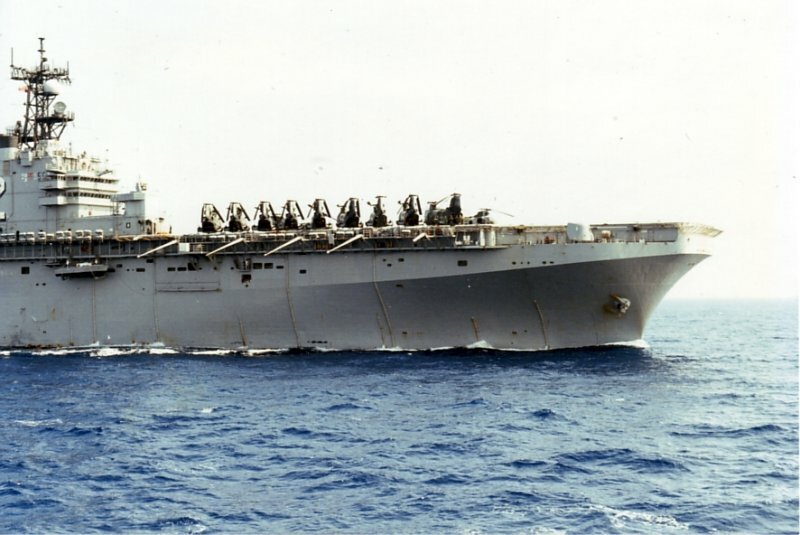 The Nimitz-class aircraft carrier and embarked Carrier Air Wing 7 (CVW-7) were on a regularly scheduled deployment in support of Maritime Security Operations. 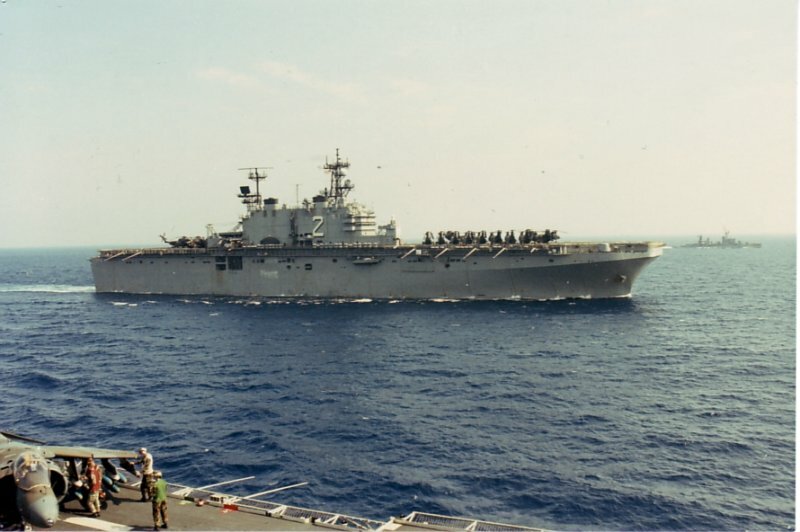 74k USS Saipan (LHA 2) conducting operations in the Arabian Sea while deployed in the 5th Fleet Area of Responsibility (AOR) conducting maritime security operations (MSO) in support of the global war on terrorism, 21 November 2006. 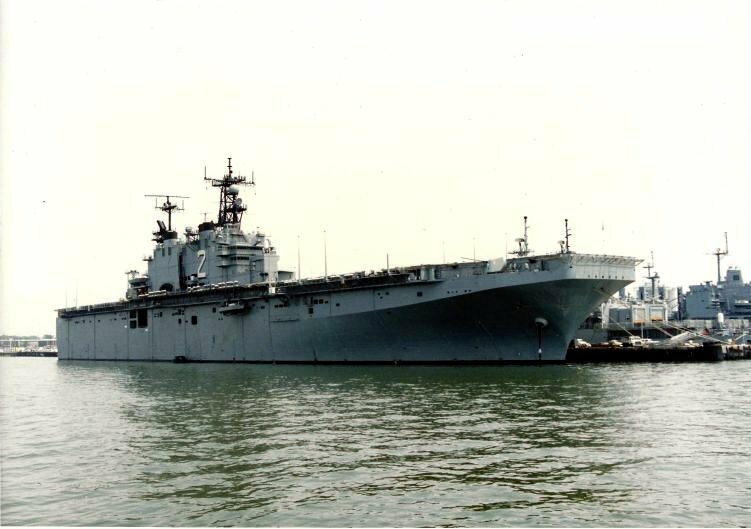 105k Rear Admiral. 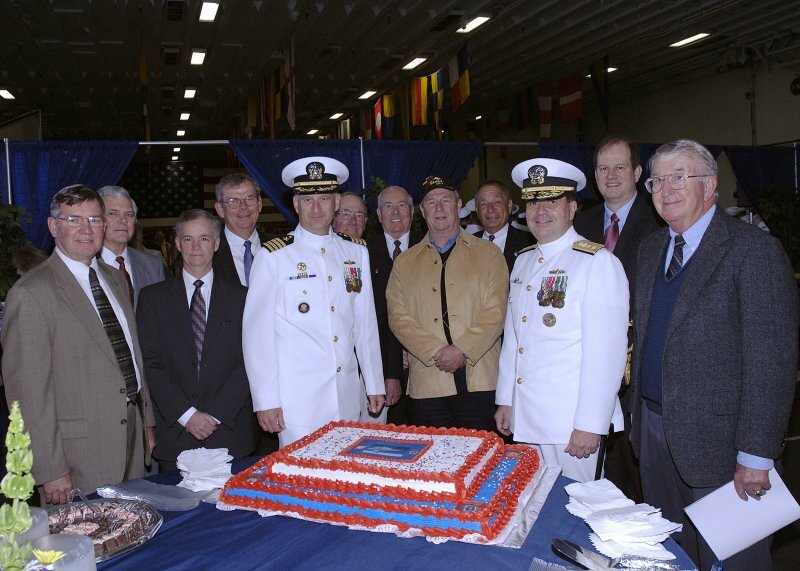 Michael P. Nowakowski and Captain Richard D. Fitzpatrick pose for a photo with the rest of the former commanding officers of USS Saipan (LHA-2) at the ship’s decommissioning ceremony. 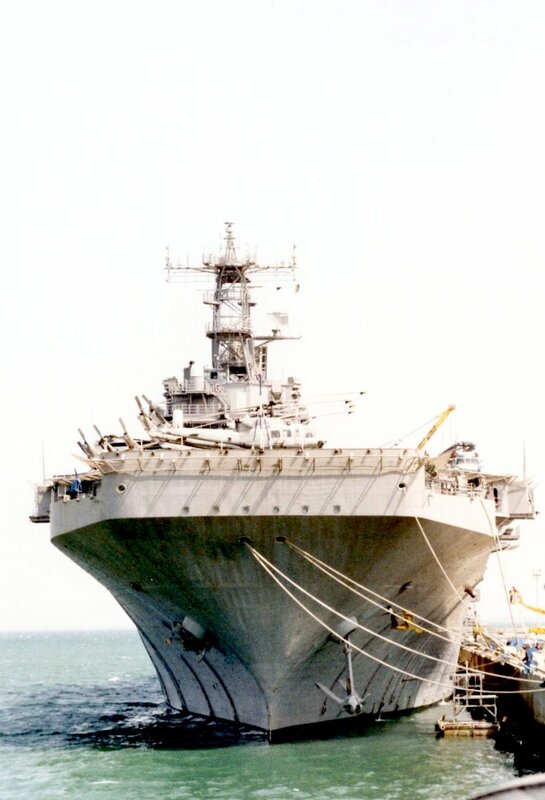 Saipan was decommissioned after nearly 30 years of service. 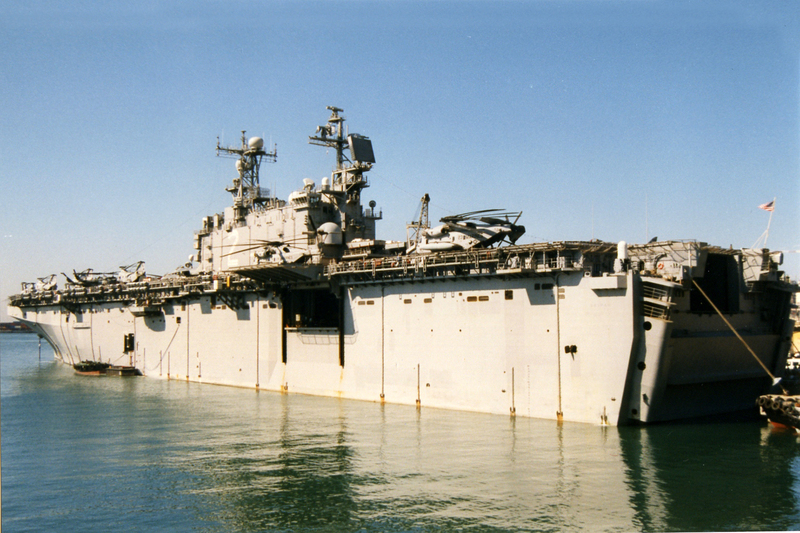 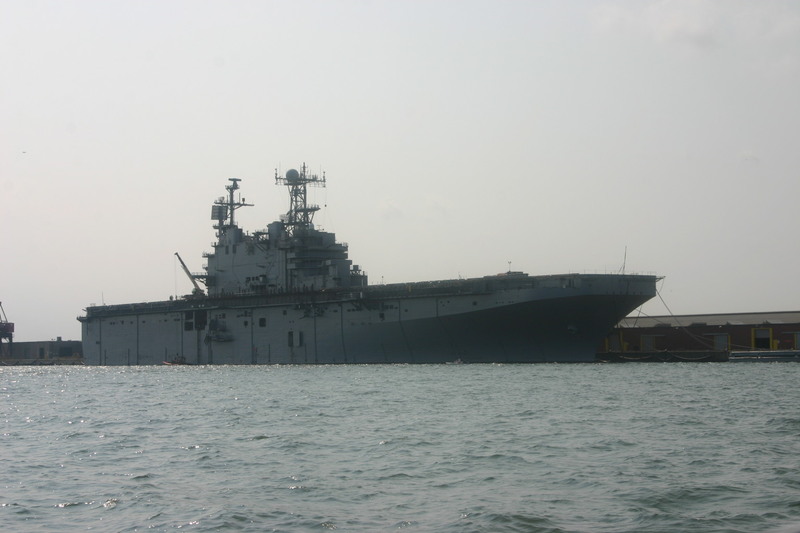 244k Decommissioned USS Saipan (LHA-2) moored pierside at Moorehead City, North Carolina, 16 June 2007. 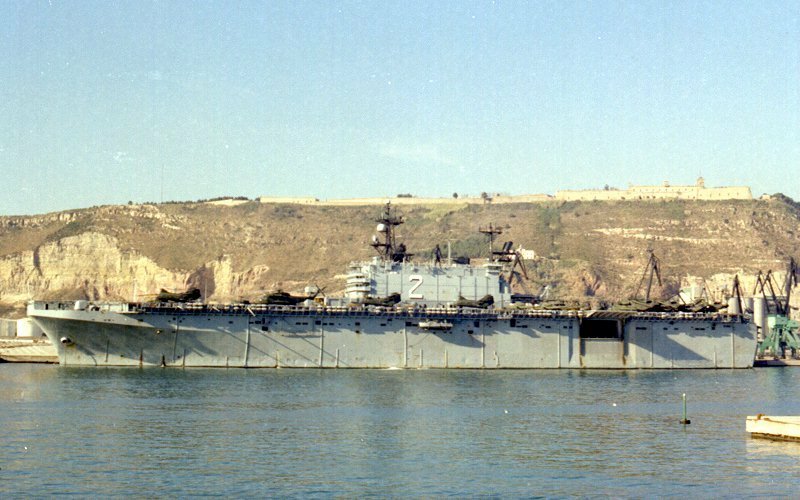 Photo by Owen R. Smith CWO-4, USMCR Ret. 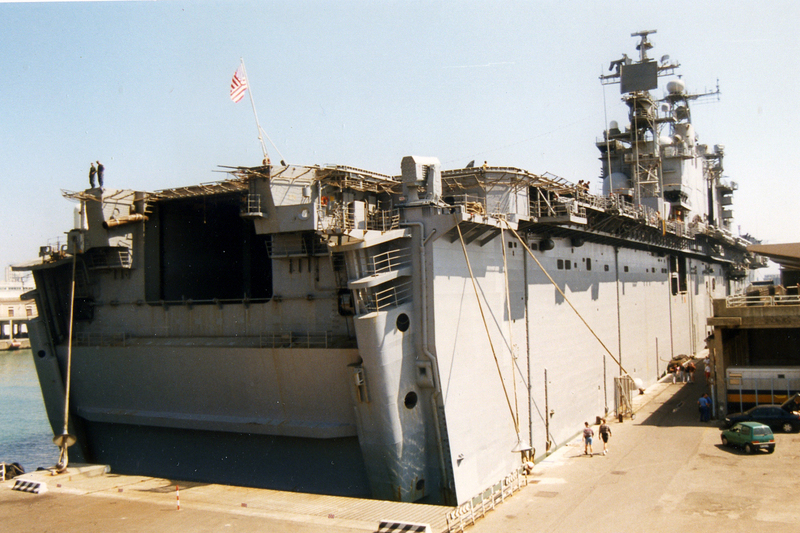 236k Decommissioned USS Saipan (LHA-2) moored pierside at Moorehead City, North Carolina, 16 June 2007. 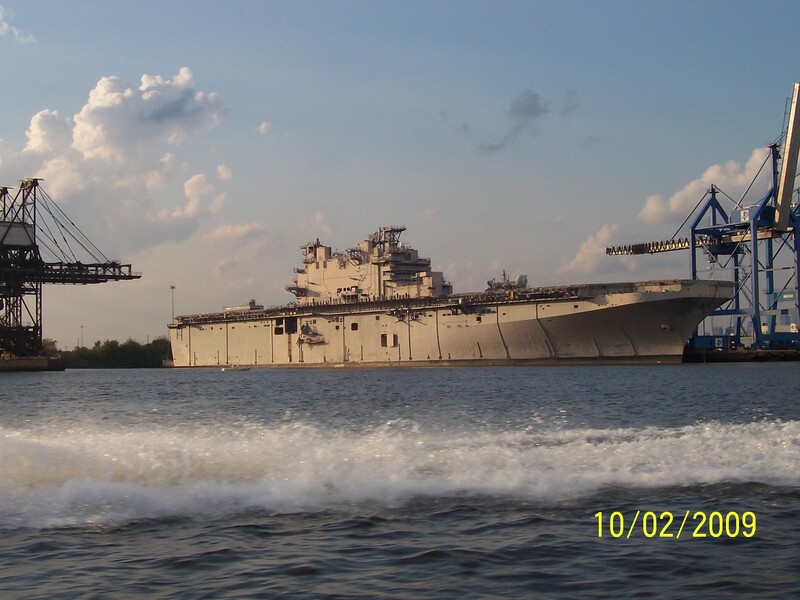 Photo by Owen R. Smith CWO-4, USMCR Ret. 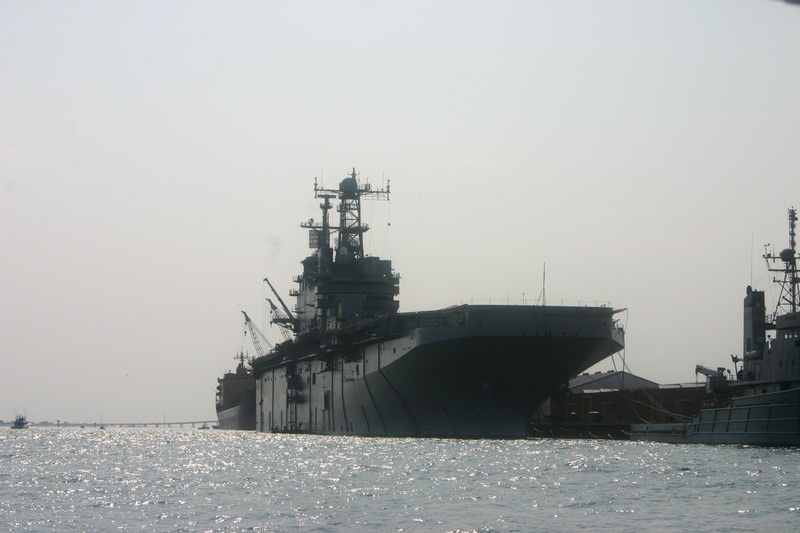 255k Decommissioned USS Saipan (LHA-2) moored pierside at Moorehead City, North Carolina, 16 June 2007. 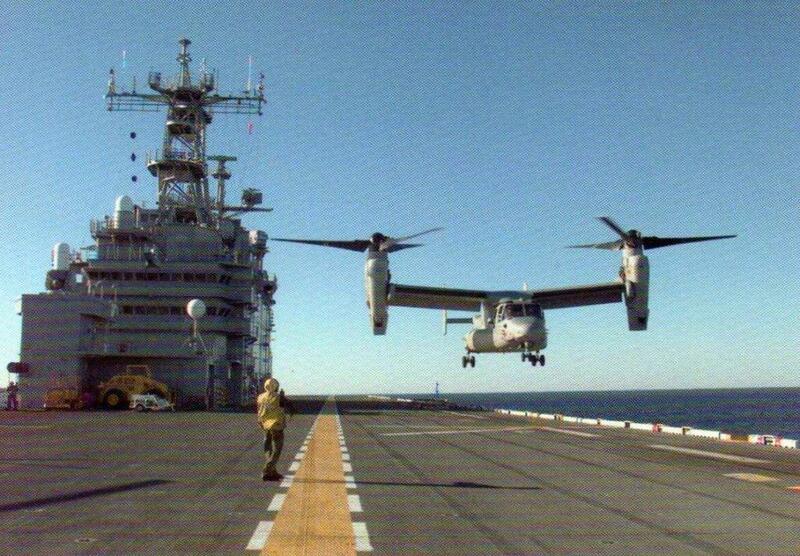 Photo by Owen R. Smith CWO-4, USMCR Ret.